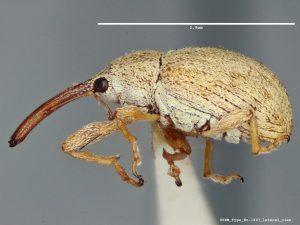 DPI recently identified several weevil samples collected from Miami-Dade, Broward, and Hernando counties as Anthonomus testaceosquamosus, the hibiscus bud weevil. This weevil is currently found in Mexico and Texas, and it causes significant damage hibiscus flower buds. Adults lay eggs on the buds, and larvae burrow into the developing buds where they feed on the pollen. Larval feeding results in flower bud drop. If you notice flower buds dropping off your plants, break open the dropped buds to see if there is a beetle larvae inside. The presence of a larvae may indicate a hibiscus bud weevil infestation. Weevils are tan in color with a dark brown rostrum. Photo: Ashton Smith, Symbiota Collections of Arthropods Network (SCAN). If you suspect you have found this pest in your flowers, contact the DPI Helpline (1-888-397-1517) or send a specimen to the UF Insect Identification Lab. You can learn more about the hibiscus bud weevil in this DPI Pest Alert. You can also view high resolution photos in the SCAN catalog.